When I invented Anson Curtiss Tennant as my avatar in turn-of-the-century Agincourt–the naive young man infected with enthusiasm who would design its public library–I brusquely decided that he would be a “one hit wonder.” He would design an homage to Louis Sulllivan and then be safely swept from the scene by gypsies, harpies, or some natural disaster. If the solution to this design problem (which I had proposed for myself) were successful, I didn’t need the responsibility of a second act. Since the project was set in 1914-1915, young Tennant (aged twenty-five) would go in a noble way, however, as one of 1,500 souls who went down with the RMS Lusitania on the 7th of May, 1915. You’ll be relieved to know that Dr Bob, my therapist, is O.K. with Agincourt. He sees this project as a therapeutic exercise and would only be concerned if I were to call United Van Lines and begin packing for the move. One day he asked a fruitful question; that is, after all, why he gets the big bucks. “Does Anson have to die?” he inquired. I honestly had no good reason; neither did I have an even remotely convincing bad reason for killing him off. In my mind, Anson had already set sail for Liverpool, so later that afternoon I had to contrive a rescue. The ship would sail from Pier 54 in New York harbor as it did on May 1st. And it would sink, as it did, six days later, but there would be one less casualty. Bobbing in the North Atlantic, knocked unconscious and clinging by instinct to a hunk of jetsam, Anson would float undiscovered for several days and be saved by a Basque fishing boat. Read Mark Kurlansky’s The Basque History of the World and you’ll know from whence commeth help. The Basque people (Euskadi, in their language) are fierce seamen who have been fishing the Grand Banks and elsewhere in the North Atlantic since before there were written records. If anyone could save Anson, it would be them. Amnesiac and dehydrated, they took him home to Donostia (the port we call San Sebastian) to recouperate at a convent hospital. Suddenly Agincourt had a future. The fog had not simply cleared long enough at the outbreak of WWI to accommodate my creative ambitions and then as conveniently close in upon that world. Magically, doors had opened in both directions: Anson would require ancestors and now he could also have progeny! Having lost his memory and all other identification (now I know why grandmother sewed those name tags in my shorts), Tennant recouperated slowly on Spain’s northern coast. His nurse would be a fourteen-year-old girl (ten years his junior) named Graxi Urrutia. My dim grasp of the Basque language had named her prophetically: “Grace, who doesn’t live here” or “Grace, the foreigner.” They would marry in five or six years and bear three children: Aitor, Alize and Mikel. I could now look forward to a reunion. But, in the meantime, how would Anson’s family cope with what they believed to be his loss? And just as important, how could an amnesiac build a life without foundation? Now you know why he has two death dates. A few days ago sleuthing on eBay (what day aren’t I doing that?) I found a wonderful painting by California artist James Hartman. It’s titled “Pescadero” and dated 2010. Clearly this painting is telling a story, though probably not the one Hartman would narrate if he were having coffee with us this afternoon. 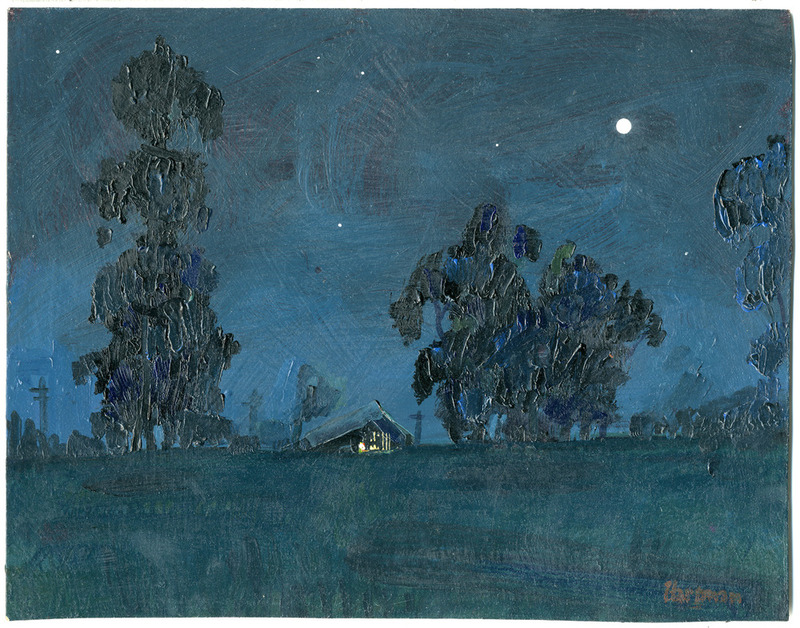 This scan of the painting is far too bright, though I have no idea how to tweak PhotoShop and deepen it. Perhaps what I’ve posted has lost a bit of the quiet stillness that drew me in. (Where’s Van Gogh when you need him.) Regardless, what I saw was an artifact, a shard of material culture that would find its way to Agincourt. A vehicle for telling another piece of the story. So much of Agincourt’s history to date has been urban. Farm folk are invoked only when they’ve come to town to shop or transact business at the courthouse or bank–or to be buried, like Neil Klien’s parents in the winter of 1933/4. I saw this painting as an opportunity to correct that imbalance; to talk about a rural life that is unknown to me. To become less ignorant. What’s going on here? The lights in that barn (it is a barn, isn’t it?) might be in Pescadero or Bethlehem. Machs nix! I think the lights are burning late into the night because this is calving season and there is a difficult delivery taking place, either late or early; I don’t know which yet. But it has to be a special birth, perhaps an albino calf that will be fodder for conversation at the Koffee Kup Kafe for weeks and a reason to drive out from town and gawk and talk and stroke its milky innocense. What do I know of the sights, sounds and smells of the farm? Seems to me I’ve got a lot of homework for the weekend to tell this story right. Ellen Degeneres is a genius. Her comedy routines–especially the HBO specials–have been a strong influence on my writing. The Neil Klien case is no exception. I’ve watched Ellen’s specials so many times that I know precisely when to laugh, which doesn’t make her any less humorous: I know when I’m going to laugh and now I know why. Familiarity has actually allowed me to appreciate the subtle architecture of her story-telling. To be more precise, it isn’t knowing when to laugh; it’s knowing where, because her stories are cunningly crafted journeys. We know the destination from the outset, but the path isn’t always clear and the side-trips are unexpected. The surprise is that we inevitably come home, return to the point of departing, often suddenly, and are changed by the experience. Thomas Mann was wrong: you can go home again. It’s there waiting; you’re the one who’s changed. Whether Neil wrote those editorial comments is immaterial. He had reason to hold at least one of those opinions and I’m hardly in a position to gainsay what may have been his few moments of personal retribution. That story is incomplete and I feel certain Howard will follow through. But there is another circle here asking for it’s own sort of closure. Neil Klien’s story needs to come home, to come full circle, even to be transformed. Klien’s solitary life was shorter than it ought to have been. He died in 1961, in the middle of the Cold War and his own personal version of it. He also died on the job, digging a grave in a newer part of the cemetery. It was August, a hot day, and he should have known better than to dig at high noon; better to have waited for the cooler early evening or to have begun before sunrise. He walked to a nearby tree for some shade, leaned his shovel against it, sat down and never got up. He was fifty-two. I’m actually feeling pretty good about this. Howard Tabor hasn’t been shy about naming names in his local history column, but I suspect the story emerging from this storm-tossed tombstone incident will never appear in The Plantagenet. Any lesson to be learned here hasn’t shown its face–yet. The long-hidden graffiti discovered a few weeks ago was found on multiple headstones from various sources. Since Neil Klien managed and maintained The Shades during those years, Howard and his cohorts wondered if Klien, the cemetery sexton, could be their source. It’s Fennimore county’s good fortune to have been chronicled by four generations of the same family for over a hundred years–a dynasty who approached local history cohesively, comprehensively, when others busied themselves collecting butter churns and Viking teeth–so a few hours at the History Center, the courthouse and the newspaper archive laid a foundation for some tentative but circumstantial conclusions. Neil Klien graduated from Agincourt High School in 1927, a capable student barely mentioned in Muskrat yearbooks; you’d be hard-pressed to call him a joiner. Odd jobs in town and work at the Fahnstock farm of his adoptive parents kept Neil busy and out of trouble. The Market Crash of 1929 caught everyone by surprise, though, even folks like the Kliens who had nothing to invest. They were heavily mortgaged, however, and it took little time for their farm to come under the banker’s icy stare. Court records show a spastic pattern of delinquent payments through 1933, an especially harsh winter. Neil had gone to Omaha, seeking work at the stockyards, so no one thought it odd that Mr and Mrs Klien hadn’t been seen for several days. Sheriff Pyne had delayed serving foreclosure papers as long as possible, but his reluctant trip to the farm found, instead, a cold stove and two frozen bodies. Pyne wondered for the rest of his years whether a more timely delivery of the bad news might have saved two lives. Tough call. But simply asking the question revealed a depth of character that kept the sheriff in office for many years. He carried the sad news himself to Omaha and drove Neil home for the funeral. Loss of the farm left Neil with little more than doubt and his dad’s toolbox: what could he have done differently? Cemetery board members offered him a job as its caretaker, a position that invited last words–summary statements like “hard as the banker’s heart, but smaller than his ego”–especially when such sentiments never find their way into print. Remember the point of an obituary: “to highlight the best and ignore all the rest.” So when our bank president died twelve years later, who could blame Neil for connecting the dots. Until the other tombstone testaments are explored, the story is incomplete. And the evidence is decidedly circumstantial. Lately I have something stuck in my craw about the anti-evolutionary folks who’ve found our current political milieu to their liking. Evolution may be “only” a theory, but religion can’t make even that claim. I’m reading Stephen Jay Gould’s book about Burgess Shale in Alberta and what a rich find it has been for scientists working on the Devonian and Cambrian periods. Too bad Charles Darwin isn’t around to explore the oceans of new data from those oceanic deposits and to admire how they have carried his theory beyond what the man himself could only have imagined–and would have welcomed. Smaller discoveries are often made much closer to home, however; accidental uncoverings that influence our thinking, give it direction or change its trajectory altogether. There was just such a transformatory storm in Agincourt last month. One of the oldest oaks at The Shades, Agincourt’s Protestant and non-sectarian cemetery, lost a major branch to that storm. The tree will survive, but its fallen limb knocked over a substantial tombstone and, in the process, broke the seal on a very large bucket of worms. Cemetery staff hastily reset the stone on its foundation, but before they did, someone noticed a hidden inscription, protected from the weather on its rough under side. Scratched into the surface and highlighted with red lead were these words: “Hard as the banker’s heart but smaller than his ego.” It didn’t take long for Howard Tabor to hear about this 1940s grafitti; once Howard gets his teeth into something there’s no letting go. The tombstone in question shall remain nameless; suffice to say that it marks the resting place of a former president of the Farmers, Merchants & Mechanics Bank, an amalgam of two smaller banks that joined forces in 1893. During the Great Depression of the 1930s, even local banks had to be predatory and the FM&M was no exception; its foreclosure practices were sometimes questionable and someone clearly felt they had been in this case. Howard and a few close friends searched for other similar inscriptions. So far they’ve found more than a dozen; a handful are laudatory, but the majority are short, snarky haiku like another example nearby that reads “Her life was an open book but a short story.” These ought to be collected and published. In short order, speculation on the source of these hidden editorials turned to Neil Klien, sexton at The Shades for almost thirty years. All the inscriptions are from stones placed while he was there and, as you might expect in a small community like theirs, all of the deceased were folks Klien would have known. I’m anxious for Howard to tell us why he thinks Klien is the culprit — and especially whether he thinks “culprit” even applies. I couldn’t explain anyone else’s behaviour and certainly wouldn’t know where to begin letting you in to the workings of my own imagination. Admitting that up front, however, isn’t going to stop me from trying. Here’s what’s going on in my head as Agincourt’s newest citizen takes form. Figures of speech and word games fascinate me; indeed, they occupy a lot of my time (riding in elevators; checking out at Cash Wise; sleepless nights at home). Palindromes were a topic in one of my classes recently, so I thought someone with a palindromic name ought to live in Agincourt. Within a few minutes Neil Klien had become one of its ever-growing cast of characters. Klien needed an occupation, perhaps something concerned with beginnings and ends, since palindromes are the same from either direction. Why not a grave digger? Every town had one, though these days graves are backhoed with very little ceremony; I saw some of that inelegance at Marlys Anderson’s funeral last week. Big yellow tractors with a come-to-me bucket don’t belong on public display at a grave yard. The solemnity can’t compete. Old-time grave digging must have been a fairly solitary activity. Very particular, some might even say peculiar, personality types were drawn to it as a livelihood. So Klien shouldn’t be married and, for goodness sakes, he shouldn’t have children to be abused by their schoolyard classmates with sing-songy jabs about a parent’s work. He needed to be a singularity. A thoughtful man of few words. Someone formed from tragedy and seeking answers, as we all do, to why bad things mangle the innocent and the good. Klien would be born into adversity, his mother an inmate at the local bordello Mrs. Miller’s Enterprise. Some of Belle Miller’s girls got pregnant; accident’s happen, but no child should be conceived without intention. So if Sissy Beddowes herbal remedies couldn’t help, there was Maud Adams’ underground adoption agency. These three women had already formed a sort of “trinity” in the emerging history of the town. “Arrangements” were made for the unnamed infant to be placed with the Kliens, a childless middle-aged couple who farmed the other side of Fahnstock. They named him Neil, a homonym hinting at the prayers they’d offered to have a child. But Neil was born on a Wednesday, and as we all know Wednesday’s child is full of woe. The Kliens were good parents, providing what they could from meager resources. When the one-room Fahnstock school closed, Neil came to Agincourt elementary and found that his reputation had already arrived: the circumstances of his birth spread rapidly from the callous gossip of adults through the cruel agency of children. I had reluctantly let loose a life, one already scarred by the age of ten. I wonder how it will resolve itself. Thursday/23/September/2010 11:22 pm / 1 Comment on Howard who? Howard Tabor, purported author of “A few figs from thistles…,” lives a quiet unpretentious life in Agincourt, a modest Iowa town where he was born sixty-five years ago. As a high school graduate in the early 1960s, a career in journalism for Tabor was farfetched, not to say unthinkable. He aspired to be an architect, like his great-uncle Anson Tennant, designer of the old Agincourt Public Library in 1914-1915. But one semester at the State University in Ames convinced Tabor that the profession might tolerate him at best; it would certainly never welcome him into its ranks or files. Architecture, he knew, was both art and science; the art he could learn, the mathematics he would endure, but it was the unforeseen business of architecture that dissuaded him from making any further commitment to its five-year course of study. He was, it turned out, a devotee of words; words carefully chosen but not always deployed with diplomacy or tact. A quick lateral move to the English department afforded Tabor a middling anonymity and time to marinate in language. Seven semesters later, he graduated into a world where uncertainty was sure, and his job prospects obtuse at best. It was 1968 and all that that entailed. Nineteen sixty-eight changed all of us: Anson Tennant died during the winter; Howard Tabor graduated that spring; and American political life ruptured during the summer of our discontent at the Democratic National Convention. Chicago called to him—perhaps with the same voice that had beckoned great-uncle Anson — to engage there with the architecture of words. So in the fall, Howard found an apartment on Chicago’s north side and a job on its south, as part-time staff for Draugas, a Lithuanian Catholic newspaper — an odd choice, since Tabor was neither, and journalism hadn’t even been his major. Additional income came from work at a used and rare book dealer on North Dearborn Street near his apartment. Coincidentally, he also lived only seven blocks from the Chicago Historical Society headquarters in Lincoln park. This triangle defined life for the next three years, until an opening at the Plantagenet brought him home. If you didn’t already know, Tabor is part of the extended Tennant family, a double-edged sword in that part of Iowa. The Tennants were interested in everything — media, manufacturing, culture and heritage — so it’s hard to say if their connections played a role in landing the job. From July 1971, Howard has honed his craft, writing everything from ads to obits; selling ad space and subscriptions; working hard to keep the paper afloat into the digital age. The up-side of this extended family has been easy access to information, the sort that rarely qualifies as “public record.” His columns are redolent with those intimate personal insights; history as oral tradition. More personally, Tabor lives with his partner Rowan Oakes, history teacher at Fennimore County High. The two of them recently undertook a daunting project: restoration of the Wassermann Block, new home of The Periodic Table, Agincourt’s newest restaurant, and also a bed-and-breakfast on the second floor. Other “bucket list” projects include writing a family history (for private circulation), a more public anthology of his “Few figs…” columns, and yet another exhibition in October 2012 to celebrate Agincourt becoming the Fennimore County seat. As the blog drones on, I’ll include some chunks from those 150-plus columns just in case you’re curious. Stay tuned. As always, you’re comments, contributions and criticisms are welcome.